From today until next Friday, March 11th, the free KTQ50 film is Now We Live on Clifton (1974). This film was created by members of the Kartemquin collective, with credits shared among Jerry Blumenthal, Alphonse Blumenthal, Susan Delson, Sharon Karp, Peter Kuttner, Gordon Quinn, and Richard Schmiechen. In this week's video extra, Now We Work On Clifton, Pam and Roxy visit the Kartemquin Films studio for an update 40 years after the making of Now We Live On Clifton. New Trailer: The Kartemquin Collection Volume 4: The Collective Years (Now on DVD!) 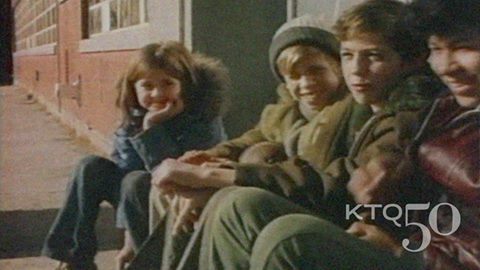 Featuring the 1974 Kartemquin classics Now We Live on Clifton; Winnie Wright, Age 11; Viva la Causa; and Trick Bag. Use code KTQvol4 for 25% off your pre-order before March 15th. !KTQ V4 Trailer FINAL -vimeo 5000kbs from Kartemquin Films on Vimeo. Still: Collective-era, Kartemquin co-founder, Gordon Quinn. Still: Collective-era members Gordon Quinn and Betsy Martins in Kartemquin's studio at 1901 W. Wellington Ave. in Chicago. On Saturday, March 12th at 2PM at the Chicago Cultural center, meet Pam Taylor along with fellow Kartemquin film participant Winnie Wright (star of Winnie Wright, Age 11) and original 1970s Kartemquin collective filmmakers Peter Kuttner, Sharon Karp, and Suzanne Davenport who will be on stage for a discussion following a screening of three short works from the collective years: Now We Live on Clifton (26 min., 1974), Winnie Wright, Age 11 (26 min., 1974), and Viva La Causa (12 min., 1974). Now We Live on Clifton (26 min., 1974), Winnie Wright, Age 11 (26 min., 1974), and Viva La Causa (12 min., 1974). The event is hosted by WTTW and in partnership with the Department of Cultural Affairs and Special Events and Kartemquin Films celebrating 50 years of Kartemquin Films. Stay tuned for the upcoming DVD release of The Kartemquin Collection Volume 4: The Collective Years featuring Now We Live on Clifton; Now We Live on Clifton; Winnie Wright, Age 11, Viva La Causa; and Trick Bag. All four films are released on DVD for the first time, in digitization of original 16mm prints newly restored through a grant from the National Film Preservation Fund. Get more information and order your copy here.